During the 1850s Sir George Grey, Governor of the Cape from 1854-61, played a leading role in the establishment of educational institutes throughout the colony. 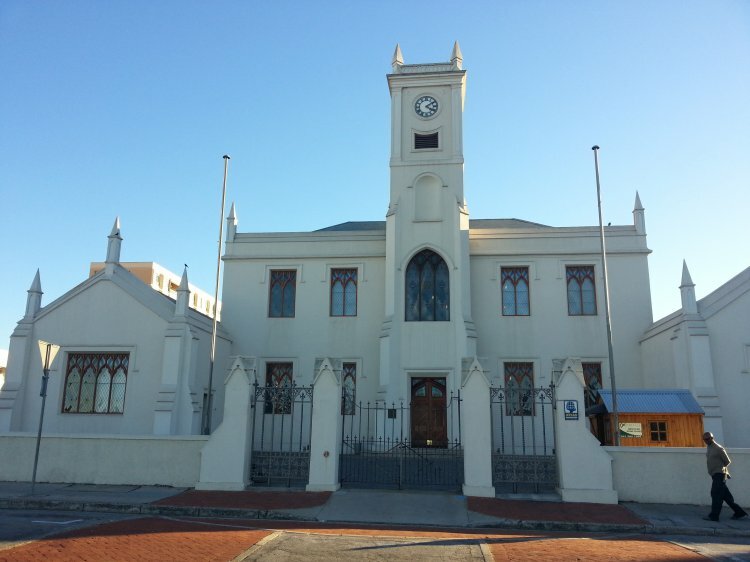 At the instigation of John Paterson, one of Port Elizabeth's the first Town Councillors, the municipality took over vacant land on top of the hill opposite the Donkin Reserve, where it proposed to erect a grammar school. In September 1856 a Mr Archibald was commissioned to prepare plans and specifications for the building, and by the end of 1858 the school was ready for occupation. It was named in honour of the Governor, in recognition of his contribution to education in the colony. In January 1859 elementary classes were commenced and in April the high school was formally opened. In 1875 a clock tower was added to the building giving it its dominant character over its surroundings. By 1914 the building had grown too small for its needs, and the high school was moved to new premises, which became known as the Albert Jackson School, while the old building continued to serve the needs of the preparatory school. It was declared a National Monument under old NMC legislation on 10 December 1976.